The growing repression of free speech and assembly in Bahrain has drawn concern around the world as it intensify its “campaign of persecution” against those working to promote human rights in the country. A group of independent United Nations experts today voiced serious concerns about the “campaign of persecution” against the pro-democracy opposition and the arrest of a human rights defender. Political cartoon by Carlos Latuff after Rajab was arrested in May 2012. The experts called for the immediate release of human rights defender Nabeel Rajab and fellow defender Abdulhadi Al Khawaja. Mr. Rajab was convicted on three charges of illegal assembly related to his participation in peaceful gatherings in favour of fundamental freedoms and democracy. Special Rapporteur on human rights defenders, Margaret Sekaggya says the sentencing of Nabeel Rajab represents yet another blatant attempt by the Government of Bahrain to silence those legitimately working to promote basic human rights. In addition, Special Rapporteur on the right to freedom of opinion and expression, Frank La Rue says the continuing repression of free speech in Bahrain runs counter to international law and standards that individuals will not be prosecuted for peaceful political speech. He urges the authorities to take all measures to guarantee the free expression of all individuals in Bahrain, whether through social media or otherwise. Earlier this month, prominent Bahraini activist Nabeel Rajab was sentenced to three-years in prison for spearheading and participating in several anti-government rallies. Mr. Rajab is already serving a three-month sentence for posting anti-government comments on Twitter. He was in court to receive the verdict. Mr. Rajab is the president of the Bahrain Center for Human Rights. The recent verdict against Mr. Rajab has drawn criticism from the international community, particularly from the United States. A spokesperson said the US expects that the verdict and sentence will be reconsidered in the appeals process without delay. The Unites States urged the government of Bahrain to consider all available options to resolve this case. The US government has repeatedly urged the government of Bahrain to take steps to build confidence across Bahraini society, and to begin a meaningful dialogue with the political opposition and civil society, she stressed. 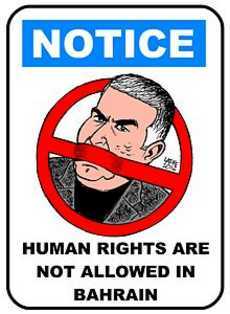 Nabeel Rajab is the leading human rights activist from Bahrain and the founder of the Gulf Centre for Human Rights. Mr. Rajab was arrested on May this year by the Bahraini government forces. In February 2011, US Secretary of State Hillary Clinton stressed that the United States supports Bahrain’s move to greater reform. Secretary Clinton also emphasized that the Americans wanted to see that the human rights of the people, including right to assemble, and right to express themselves, be respected in Bahrain. More than one year after the Pearl Uprising in Bahrain, February 2011, unrest continues amid the ongoing government crackdown against protests. A report said there has been systemic and widespread use of violence in the crackdowns as well as torture of political prisoners. Despite pledges to reform, the government of Bahrain has made little progress, and continues to deny access to the country for international media and human rights organizations, including Freedom House. Bahrain is ranked “Not Free” in Freedom House’s Freedom in the World 2012 and Freedom of the Press 2012 surveys.